Meet a guilt-ridden nurse who atones for her sins by joining her zombified patients in exile; a lone soldier standing guard on a desolate Arctic island against an invasion that may be all in his mind; a folksinger who tries to unionize Hell; and a private eye who only takes your case after you die. Visit a resettlement centre for refugees from ancient Rome; a lost country recreated by its last citizen on the Internet; and a restaurant where the owner’s ghost lingers for one final party. Discover the inflationary effects of a dragon’s hoard, the secret connection between Mark Twain and Frankenstein, and the magic power of blackberry jam—all in this debut collection of strange, funny, and bittersweet tales by acclaimed writer Matthew Johnson. Irregular Verbs and Other Stories brought me back to short novels. This is a format I used to love but stop reading for a reason I can’t explain. All attempts I made to go back to it miserably failed up till this book. It’s the first science-fiction and fantasy short stories collection I have finished since I-don’t-even-remember-when and believe me: you need to grab this book. 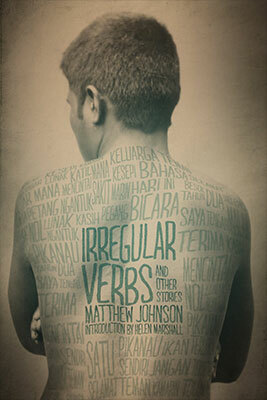 Irregular Verbs contains twenty-two short stories, ranging from science-fiction to fantasy, including supernatural, dystopian and alternate history. Each story has its own detailed, vividly depicted world, that could probably fill a 300 page novel, except it’s packed into 30. There is so much to take in that most of the time, I have felt the need to take a break between each story to think about it, let it sink and distance myself from it before the next one. I can’t emphasize enough how each short novel immerses the reader in a world with so much depth, so rich, so thought-over! This is really remarkable. Another reason why I loved Irregular Verbs was its main focus: us, humans, how we deal with loss, fear, time, love, and all our petty weaknesses. Several short novels are extremely moving: for instance the first one called Irregular Verbs, in which a widower covers the wall of his house with words from a language only he and his wife used to speak lest they be forgotten. In The Last Islander, a “displaced” immigrant try to rebuild his home islands – swallowed up by the raising ocean – in a virtual world so his people could go and enjoy it again. Even though the former short story is more on the fantasy side and the last one on the Sci-Fi side, they both pull a string in us, causing to reflect upon grief. I must admit my favourite story is the shortest of the collection and it’s called When we have time. If you spot the book in a store and ponder about purchasing it, browse right to When we have time: it’s four pages and it’s mind-blowing. It’s about a couple who received help from technology to have the child they never quite had enough time to conceive or actually even raise. Now the father just lost his job and the consequent loss of income forces the parents to tell their daughter how she came to Earth and how their new situation will terribly affect her existence. This story left me heartbroken. You won’t ever dare procrastinate again after you read it. And by the way, that’s what Irregular Verbs and Other Stories does to the reader: it makes a deep impact. Finally, I appreciated how Irregular Verbs and Other Stories gave me a lot to think about. There is the recurrent theme of our relation with time: how we cling to the past (Irregular Verbs) or how we try to disguise history (Written by the Winners), how we let time fly (When we have time), how we could explore the futures to make better choices (Outside Chance). As in any good Science-Fiction book, there is a lot of reflection about how technology can affect us, from enslaving each other (like in Lagos where workers from poor countries are wired up to remote tools like vacuum cleaners in richer countries) to actually transforming our specie (The Face of the Waters). Finally, I can’t prevent myself from mentioning the beautiful dystopian Talking Blues, an amazing new take on the myth of Orpheus and Eurydice which left me dumbfounded (in awe). Do I sound over-enthusiastic? Well, I just can’t repeat enough how much I loved this book. I’m totally dazed at the amount of creativity and details behind each world in Irregular Verbs and Other Stories. It’s just so smart, so immersive, so gripping! If you like short-novels, I have no doubt this will become one of your favourite. If you don’t, this will change your mind. Seriously, you just can’t miss this masterpiece: check it out! I agree this is a wonderful book.